A LEED-certified product, these textured panels of imitation stone are hand painted and made from high density resin. The finish is UV-resistant and lightweight enough to be installed without requiring reinforcement, like real stone does. For a hardworking, good looking alternative to vinyl siding, there’s APEX fibreglass siding. 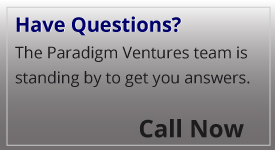 It’s more rigid than vinyl siding and is not harmed by hail or moisture. It also resists distortion. 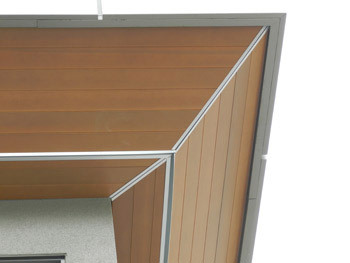 APEX siding comes in longer pieces (which results in fewer seams) and is installed with a rain screen effect. This means that when installed the product is lifted slightly off the wall and maintains circulation so moisture issues are kept to a minimum. If you want the look of cement fibre siding without the associated weight, Celect is the way to go. This product offers wind resistance up to 130 mph, few visible seams, moisture resistance, pet resistance and no exposed fasteners. Little to no maintenance is necessary with this product. Want the look of wood but not the maintenance? Cellular PVC is a premier synthetic wood option, and it is versatile enough to be used for dimensional lumber, siding and mouldings, as well as be cut and shaped, just like real wood. But, unlike real wood, it is impervious to insects, salt and even moisture. This material is suitable for both masonry and ground contact. 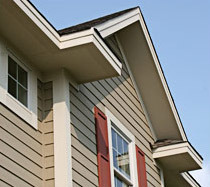 Cement fibre siding is weather- and pet-resistant, as well as both rot- and warp-free. It comes in either a smooth or wood grain look finish, and it can be pre-painted or primed for you to customize after installation. Because cement fibre siding is much thicker than vinyl siding, your building will have dramatic shadow lines and a sophisticated look. 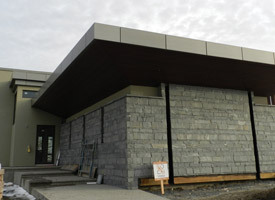 Longboard soffit can be used as both soffit and siding on a building. It is made of a heavy extruded aluminum with a powder coat finish. It requires no paint maintenance, and it can be purchased in both solid colours and wood grain finishes. The product is weather-resistant and not impacted by fading, rotting or peeling. 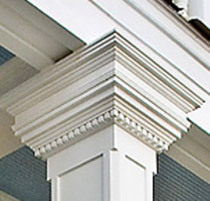 Its fasteners are hidden, so it has a clean look, and it can be installed year-round in any weather. Silva Panel is an engineered wood product made from strips of Western Redwood laminated together, and it is suitable for both interior and exterior applications. 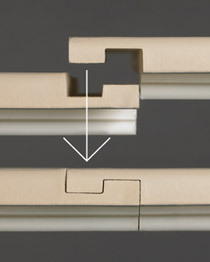 This image demonstrates how Silva Panel looks when applied as soffit and fastened with metal clips/flashing.